Is it really Spring? Here at Eatons’ Ranch, we follow the calendar very closely; not the particular days so much as the month and the season. When we flip the calendar page to March, we know there will soon be new calves on the ground and that spring is right around the corner. Today is April 1, so we are officially eleven days into spring. This is hard for us to believe as it doesn’t seem we had much of a winter. We certainly had our share of cold weather through January, but it has been relatively mild since, and unfortunately we have had little snow. If one of our longtime guests was still able to call us about the snow pack, we wouldn’t have much to tell him. Spring along the Bighorn Mountains can seem like winter in most other places. We typically get the majority of our snow in April, so maybe it is still on the way. It is hard to complain about this weather as the mild temperatures are great for calving, and we can get a head start on outdoor projects before the season begins. One thing I have learned over the last 15 years is that nothing is ever good enough for ranchers when it comes to the weather. Mild dry temps are good for the calves but can be bad for the hay crop. If it does rain, it usually rains too hard to soak into the ground and much is wasted in runoff. If you have good moisture in the spring and a lot of grass to follow, then the fire danger increases as the hot days of August roll around. We can be hard to satisfy because there are so many variables at stake! Much like everyday life, nothing goes exactly the way you want it to. There are so many things that are out of our control, and the weather is often the least of these. 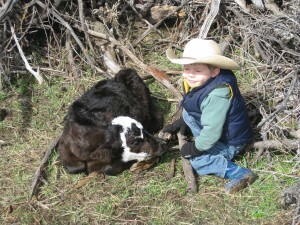 One thing we can control here at Eatons’ Ranch in the spring is our preparation for another guest ranch season. Before we know it, the calendar will read May 29th and we will be welcoming new and familiar faces to our home in the Wild West. We hope you can find some time to join us and enjoy a dude ranch vacation like no other. We would love to share with you our way of life and give you a true western horseback riding experience. And we promise not to complain about the weather. News, Events and Specials from our blog.